UPDATED: Fri., July 14, 2017, 6:35 p.m.
Hey, we’re used to diabolical green complexes, tree-lined fairways, pot bunkers, waste bunkers, green-side bunkers, fairway bunkers and water hazards of all shapes and sizes. Uphill, downhill and sidehill stances. The 200-yard-plus par 3s, 450-yard-plus par 4s and 600-yard-plus par 5s. Not much can make a golfer do a double-take anymore, but this caught my eye. And not because it was another scary stumbling block designed to make it harder to coax my golf ball into that elusive 4.25-inch diameter hole. I play the Coeur d’Alene Golf Club more than any other track in the area and about a year ago it started to look different. Sand disappeared from bunkers on numerous holes, some were reshaped, drainage was installed and gorgeous green sod was placed down. Told you it wasn’t scary. 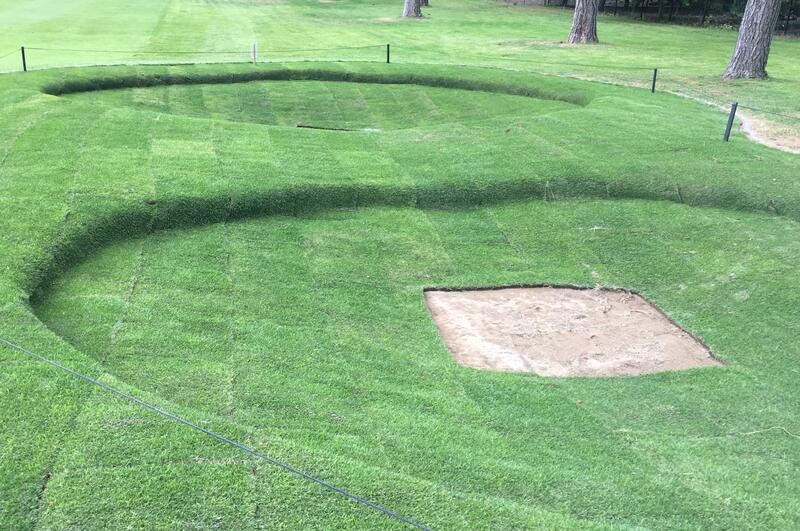 Eventually, the sod was sprayed with grass killer and the bunkers were refilled with sand. I’d never witnessed this process before, but apparently a number of courses in the area have done the same thing with their traps, proving, strictly for job purposes, I need to sample a wider variety of courses. Sand traps traditionally have a liner – something akin to the weed-block fabric you might use for landscaping – that usually requires some type of fastener. “There’s a jillion liners out there, like a gunite coating you’d see in a pool or a stucco on the side of a building,” Coeur d’Alene Resort superintendent Kevin Hicks said. “Those are running around $3, $4 bucks a square foot. Very effective, but expensive. The Resort has rebuilt six traps in the last few years and saved quite a bit of money. Coeur d’Alene public started its rebunkering project last year, concentrating on “first and last impressions,” said superintendent Brandon Bubar, explaining that entailed Nos. 1, 2, 9, 18, 10 and 11. Some traps were “modernized.” On No. 4, a long trap bordering the left edge of the green is being divided into two pot bunkers. The same change is planned for the bunker behind the majority of the 14th green. The finished product has been well received by superintendents. “We had one of our worse falls and springs for rain and those newer bunkers survived just fine,” Bubar said. “We didn’t have hardly any washing out. The drainage was really good. All of Coeur d’Alene public’s traps should be completed by next year. The number of quizzical looks from customers is shrinking. Published: July 14, 2017, 6:22 p.m. Updated: July 14, 2017, 6:35 p.m.